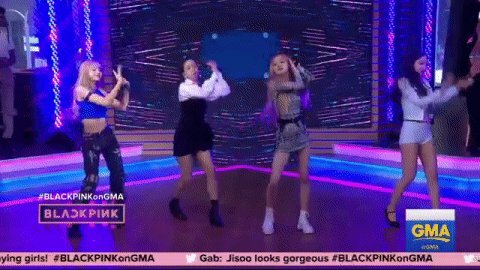 Good Morning America's tweet - "YASSSS QUEENS 🖤💗#BLACKPINKonGMA WE'RE SCREAMING! #BLACKPINK #블랙핑크 #INYOURAREA "
YASSSS QUEENS 🖤💗#BLACKPINKonGMA WE'RE SCREAMING! They were awful!!! Their dance steps were not synchronized, and they can’t sing. Looked like kids in a high school talent show. This Kpop nonsense needs to just go away. So many trolls, wow. Anyway, blinks, try not to pay them any attention specially if they are obviously just hating. Have a good day! ALL I CAN SAY IS OH MY GHADDDD!!!! QUEENS INDEED.. THANK YOU GMA!! watched live 12hrs ahead of time..... yazzz Manila Philippines here givin up some love.